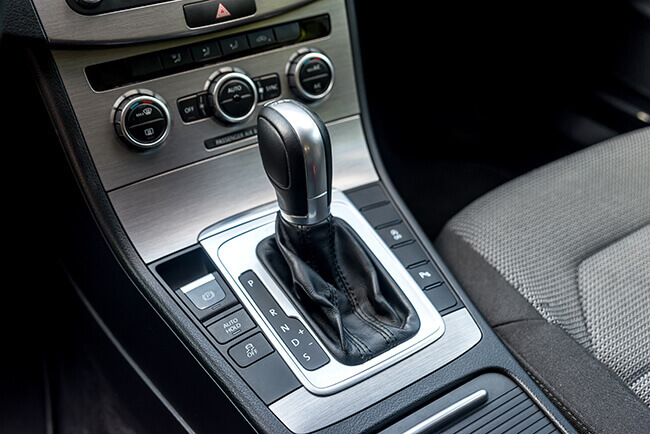 A vehicle's transmission is a remarkable piece of technology that is essential to its overall performance. Whether manual or automatic, the system uses gears and gear trains to provide speed and torque conversions, which transfers power from the engine to the wheels. When this section of the drive train system does not operate as designed, the vehicle often loses power, produces a burning smell, suffers reduced fuel efficiency, or generates clunking and humming sounds. If your vehicle has any of these problems or if your check engine light is illuminated, there is a good chance that you need to bring your car in. Before diagnosing a broken transmission, a Meineke certified technician will perform a computer diagnostic to find out if there is a problem in the control system. This can also help identify an electrical component that might need replacing. The malfunction might be due to a sensor, instead of a mechanical problem. However, if you have a fluid leak, you may need to replace the pan bolts, drain plugs, seals, gasket and fluid lines. In other instances, the transmission fluid might need to be changed and flushed. If necessary, having your transmission flushed can help get your car back to running as intended. A fluid flush is essentially a process that helps push out grime and sludge that has accumulated over time. First, the old oil is removed. Then, new oil and sometimes cleaning solutions are run through it to help remove the unwanted debris. Finally, the transmission is filled back up with new oil. Technicians will follow the guidelines recommended by your vehicle's manufacturer when performing the transmission fluid exchange, and if necessary, change the filter as well. The worst case scenario is that the transmission will need to be replaced or totally rebuilt. You should always have a technician change the fluid at regular intervals and avoid overheating. 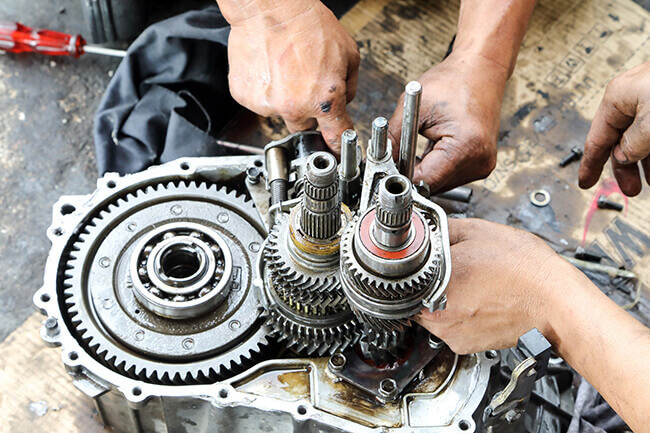 Depending on how worn out the parts are or how much damaged they’ve caused, our technicians might be able to rebuild your transmission, rather than having it replaced altogether. It’s a far more cost-effective solution, as only the parts that are extensively damaged get replaced, while our technicians fix everything that can be repaired. The initial diagnostic will help determine whether this is a feasible solution for your vehicle, or a full replacement is in order. This also depends on whether you have a manual or automatic transmission. Adhering to your manufacturer's recommended transmission service schedule will allow your vehicle to function as designed. Whether you’re seeing a fluid leak under your car, or you’re experiencing any other signs, bring your vehicle in, as you’ll want to fix any damaged parts as soon as possible. Call or visit your local Meineke Car Care Center for effective, expert transmission service at an affordable cost. Q : What are the most common signs of transmission problems? Q : What is transmission fluid and why is it important to change it? The transmission fluid is a highly lubricating fluid that cools the gears inside and keeps them lubed. Because the fluid breaks down over time, it loses its ability to lubricate the gears, therefore putting them and the torque at risk. Q : How often do I need a transmission fluid and filter replacement? Always check your car manufacturer’s recommendations, but usually a fluid exchange is due every 25,000 to 35,000 miles. Q : What is differential fluid? Differential fluid lubricates the metal gears of your car’s differential, preventing them from wearing down and fail. It’s important because it keeps your car balanced for a smooth and safe ride. Q : Can you fix my transmission or do I need to rebuild or replace it? Transmission problems can be costly, so fixing versus replacing is a very common debate. If your current transmission is diagnosed with minor problems requiring a minimum amount of parts replacement, then fixing it might be a good option. However, if you’re experiencing many problems or it takes too long to diagnose, then you should consider replacing or rebuilding it. Q : How can I protect the car’s transmission? Check your fluid regularly for strange smells and colors, as well as a potential leak. It’s also important to use the right type of fluid for your vehicle. Your driving habits can also affect the transmission, such as changing gears while the car is still moving or not allowing the engine to warm up before starting to drive.